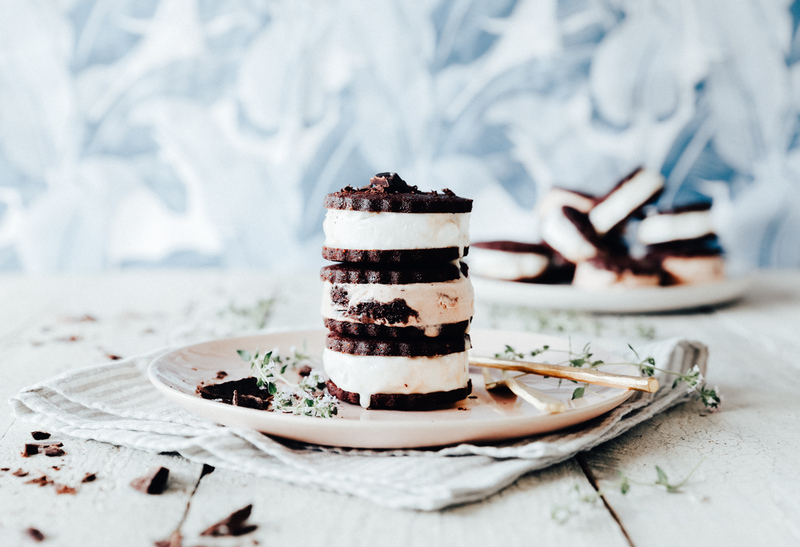 These double chocolate ice cream cookie sandwiches have been on my to-do list forever! I’ve seen so many mouthwatering versions on social media that I was inspired to create my own Swoon Food version, i.e. dairy, gluten/grain free, and low in sugars. After trialling a spiced cookie version on Christmas day I decided chocolate cookies were definitely the way to go. If you’re going to do it, you might as well go the full way – right?! I based the chocolate cookies off my Oreo cookie recipe from many moons ago. 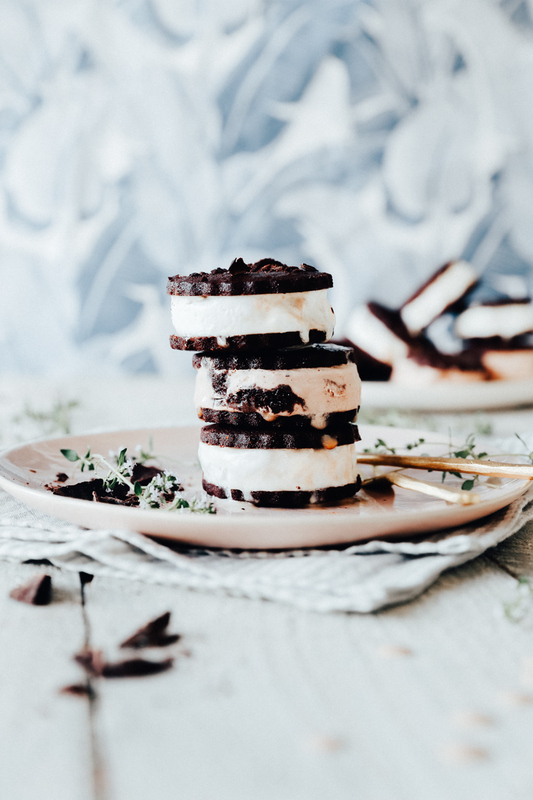 They’re a delicious, dark chocolate flavoured cookie, that stays nice and flat after baking, so are perfect for sandwiching ice cream together. This new version, however, is much lower in sugars and uses raw cacao powder instead of dutch process cocoa. The reason I used dutch process cocoa in the original Oreo cookie recipe was the achieve the classic, dark Oreo colour. Unfortunately, dutch process cocoa powder loses much of it’s nutrients in the processing, so raw cacao powder is the healthier choice. To read more about why raw cacao is so good for you, check out this raw chocolate brownie mousse cake post. Raw cacao does creates quite a rich, decadent cookie though, so if you’re making these for kiddies either sub out some of the raw cacao powder for more flour, or use regular cocoa powder instead. 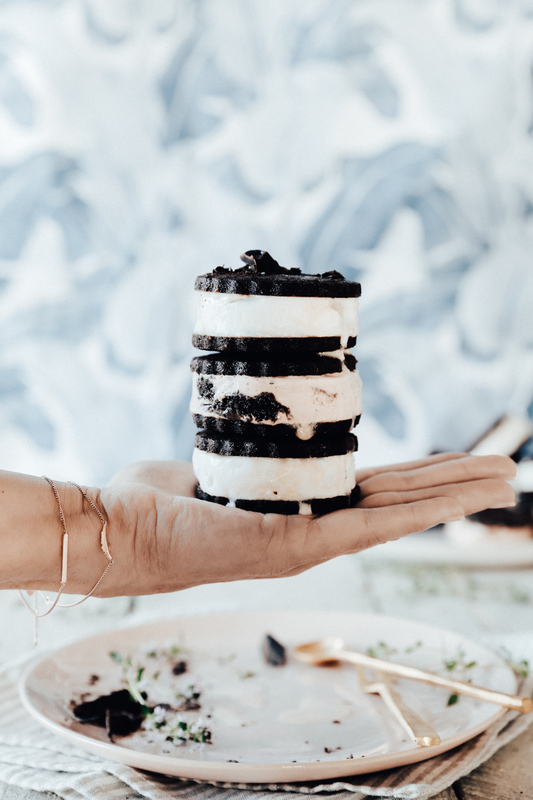 There’s a trick to making ice cream cookie sandwiches that don’t immediately melt in your hand – which I learnt the hard way! Instead of scooping ice cream straight from the tub and squishing between cookies (unless you uber messy is your thing! ), the best way is to prep your ice cream ahead of time. All you need to do is allow a tub of ice cream to soften, spread it into a brownie pan and allow to set. When firm, cut rounds using the same cookie cutter as your cookies, sandwich the ice cream round between two cookies and return to the freezer to allow it to set. The key is to make sure the chocolate cookie is the same temperature as the ice cream so that the ice cream doesn’t melt before you get a chance to eat it! 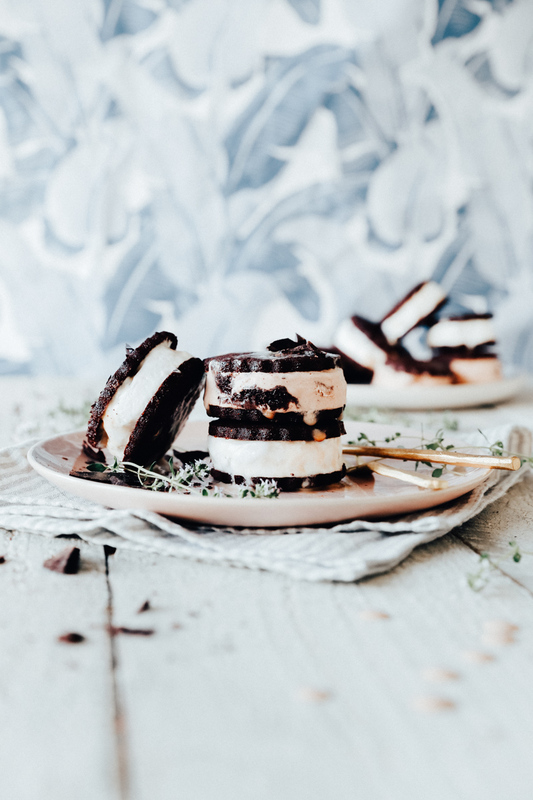 You could, of course, get all fancy and roll the sides of the ice cream cookie sandwiches in toppings such a coconut, chocolate chips or freeze dried raspberries. But if you’re anything like me, you’ll probably want to eat them well before any of that! Ok, who am I kidding. These are seriously good so you’re going probably going to eat them in one sitting, but they’re worth it! 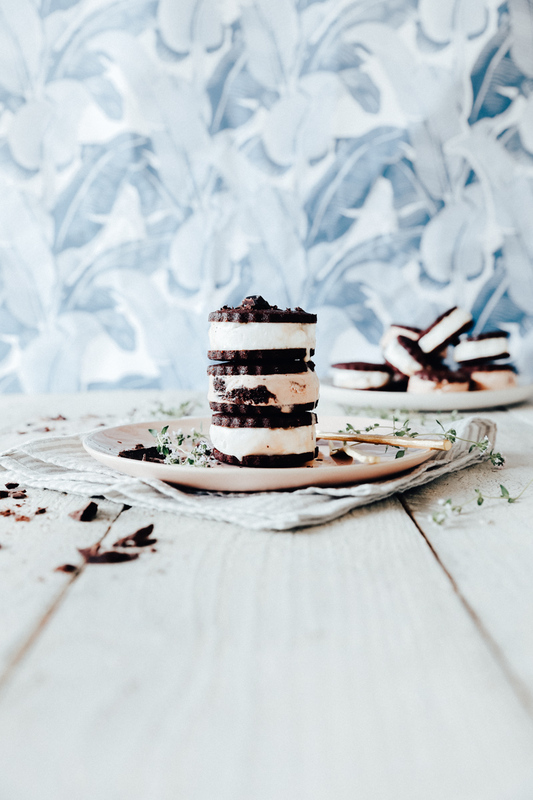 If you make these double chocolate ice cream cookie sandwiches, let me know! To get the best looking ice cream sandwiches that don’t melt in your hand, you need to prep the ice cream first. Leave it out at room temperature for 20 minutes or so until soft, then spread it into a lined brownie tray. You want it to be quite thick, around 1 inch, then place in the freezer to set. Once set, use a cookie cutter to cut out rounds of ice cream, place them on a tray then back in the freezer until you’re ready to use them. The ice cream off cuts can either be refrozen and used to make more rounds, or put back in the tub for another day. To make the cookies, place all dry ingredients into a bowl and mix well. Make a well in the centre and add the egg, vanilla and cooled, melted coconut oil. Stir well to combine. You’ll have quite a sticky dough so place it between two sheets of baking paper and roll it out to approximately 5mm thickness. Place in the fridge to chill 10 mins or so, until firm. Preheat your oven to 180ºC fan bake. Remove the sheet of dough from the fridge and peel off the top paper. Use a cookie cutter to cut out circles and place them on a lined baking sheet. If the cut cookies start to get too soft place them in the fridge to firm up again before baking. Bake the cookies in the centre of the oven for 8 minutes, or until cookies are just firm to touch. Remove from the oven and allow the cookies to cool on the tray before transferring to a sealed container if you doh’t plan to use them straight away. 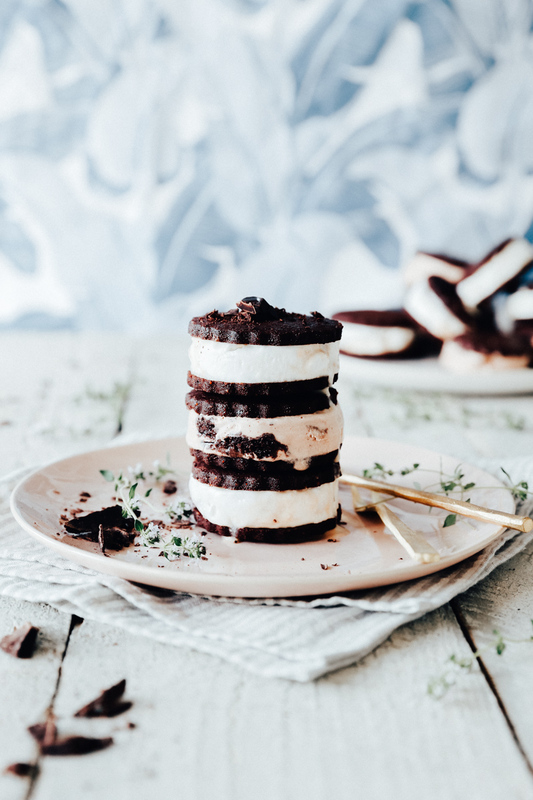 Remove the ice cream round from the freezer and sandwich a chocolate cookie on either side. Place the ice cream cookie sandwiches back on the tray and into the freezer to set again. When the cookies are chilled they’re ready to be served.